Germany’s Angela Merkel: The World’s Eco-Villain? KIM BROWN:	Welcome to The Real News. I’m Kim Brown in Baltimore. A small and little-known committee of the U.K. Parliament voted on Monday to approve the E.U.-Canada Comprehensive Economic Agreement, otherwise known as CETA. The European Committee B, as it is known, appears to be the only group of parliamentarians who will have a say. And as such, it seems that meaningful scrutiny of the legislation will not occur. Furthermore, two weeks ago the International Trade Committee of the European Parliament also voted in favor of CETA. In a vote of 25 to 15 the International Trade Committee voted to advise the European Parliament to approve the deal. This is what the committee rapporteur Artis Pabriks had to say on the matter. ARTIS PABRIKS: We can really call this trade deal an exemplary trade deal because we trust each other, the European Union… Europeans trust Canadians and vice versa. And we share the same values. And if countries which share the same values are concluding such deals, it also brings these countries closer, stronger and it improves the Trans-Atlantic tie. So, in our days, when we see that the global world is turning more protectionist, more nationalistic, more inward-looking, I think it’s highly important that those who share the same values and the same goals are sticking together. And joining us today to discuss CETA and the recent vote is Jean Blaylock, who is a policy officer at Global Justice Now. She has worked for over a decade on international trade and food issues. Jean, we appreciate you being here. Thank you. JEAN BLAYLOCK:	Thank you for inviting me. KIM BROWN:	So, Jean, can we start off with an explanation as to what exactly the Comprehensive Economic and Trade Agreement or CETA is? JEAN BLAYLOCK:	It’s a trade deal between Canada and the United States, but very little of it is to do with what you might actually think of as trade; the selling of goods from one country to another. Because we already have very high levels of trade between the two regions. Most of it is about deregulation, about promoting an agenda around privatization and about increasing the control that corporations have over economy in society. CETA would allow phone companies to sue governments for changes in regulations and laws that they think might affect their future profits. So, Canadian companies could sue European Union countries and European companies could sue Canada when there are things that they don’t like in laws. This is something that has happened quite a lot between Canada, the U.S. and Mexico under NAFTA. And it’s something that would be able to happen more as a result of CETA. KIM BROWN:	So, Jean, I believe that you attended the meeting at Committee B. So, what can you tell us about what happened during that debate? JEAN BLAYLOCK:	Well, it was a debate that had been promised for months. Civil society groups and also parliamentarians had been asking our trade minister since about September last year for a chance to have a debate on this trade deal in Parliament because it’s something that can affect so many areas of life because it has this deregulatory agenda. It poses threats towards health service. It’s something that really needs to have a full democratic debate. And our trade minister had promised that there would be a debate on the floor of the House in the Parliament here. However, after a couple of months there still hadn’t been a debate. He was asked again. He again promised. This happened again. And then on very short notice, with about three days’ notice, he said that there was no time to have it as a main debate within the main chamber in the House of Parliament. But again, instead, it would happen in this small committee, which had a total of 13 members of Parliament in it, which was scheduled at the same time as the major debate happening in our Parliament at the moment about Brexit. So, everything and everybody is focused on that because, obviously, that’s very important. And this was tucked away in a corner where nobody was paying attention. It was a very disappointing debate. The MPs who were actually there were able to raise points. But those points will have been heard by very few people other than those who were in the room at the time. Now in the article Mr. Davies argued that the debate of CETA has been “confined to a committee room and silenced by the noise and fury of the Brexit debate,” something that you just alluded to, Jean. So, how is it that such a significant piece of legislation won’t be voted in by the entire U.K. Parliament? JEAN BLAYLOCK:	We actually have appalling levels of democracy in our trade policy at the moment in the U.K. even though we are leaving the E.U., partly because of people’s concerns around democracy and loss of sovereignty. Actually, we have more of a say through the E.U. than we do through the U.K. Parliament. Through the E.U., the European Parliament has to have a say in trade policy and the European Council of all of the governments within the European Union have to give a mandate for a trade negotiation to begin. And they also have to approve the trade negotiation. Whereas within the U.K., this can all be done under what’s called the Royal Prerogative. The government doesn’t have to ask Parliament for agreement to start a trade negotiation. It doesn’t have to consult Parliament and it can sign an agreement and then all it has to do is bring that agreement and do what’s called “Laying it before Parliament,” which means that they put down a notice that the agreement has been signed. If nobody objects to it within a month, then the agreement is ratified. There is no scrutiny and no possibility of having a democratic debate on the subject; something which would actually improve our trade policy. It’s not that this is process for the sake of process. We would actually have a better trade policy if there were actually the chance for there to be a proper public debate. For our representatives to be able to scrutinize what’s being done within the trade deals. For people to consider some of the unexpected effects that trade deals might have, which we’re more likely to see that happening if these things are done out in the open and more people can consider what the impacts of our trade deals might be. KIM BROWN:	So, the advocacy group The War on Want says, “The only country-by-country impact assessment of the CETA deal highlights that it will cost 10,000 jobs in the U.K. and 200,000 jobs across Europe.” So, Jean, if you know, can you tell us where this impact assessment came from and why so many jobs are expected to be lost in the U.K. and more broadly across Europe as a result of this deal? JEAN BLAYLOCK:	Well, there have been different impact assessments done and that one was done from Tufts University. The suspicion is that jobs will be lost partly as a result of deregulation. Because of the ability of large corporations to be able to consolidate the control that they have within the economy. In some areas, for instance, particularly in agriculture, the farms within Europe tend to be much smaller-sized farms and they’re not going to be able to compete with the large farms in Canada. And there will be jobs lost in this area. KIM BROWN:	Indeed. So, how do you respond to the comments made in favor of CETA by the European Committee rapporteur on trade, Artis Pabriks, who said that “CETA is a blow against nationalism and protectionism and reflects shared Canadian and European values”? JEAN BLAYLOCK:	It’s an argument that I’ve heard from quite a few MPs. I mean, these are strange times, difficult times. I think there’s a strong feeling from many people that, for instance, the approach to trade policy being taken by Donald Trump is a destructive approach and therefore people want to stand for something else. But Donald Trump is cynically using genuine anger and genuine suffering that many people across both the U.S., Canada and the European Union have experienced from trade deals in the last 20 years or so. The solution, the way to respond to that, is not just to have more of these trade deals. And many people have been losers of the result of trade. This is something that even the IMF will acknowledge nowadays; that globalized trade has losers. Although some people have benefited, those benefits have not been shared. But it has greatly increased inequality. Those concerns need to be taken seriously. People need to be prepared to reconsider our approach to trade policy and to try and come up with an approach to trade policy that would actually support the growth of decent jobs, support the environment, be able to support our climate commitments rather than just saying that we need to agree. Yet another of these highly damaging trade deals and push it through these very secretive processes, which just reinforces the suspicion and the anger that many people have about the feelings that elites are just pushing through processes without regard to their impact on everyday life. KIM BROWN:	Welcome back to The Real News, part 2 of our discussion about CETA – the European Union and Canadian Comprehensive Economic Trade Agreement. We still have Jean Blaylock on the line from Global Trade Now and Jean is explaining to us a lot of the complex nuances about this trade agreement. Well, Jean, explain to us, how does CETA compare or relate to other trade agreements, as you mentioned — the Trade in Services Agreement, TiSA, and the Transatlantic Trade and Investment Partnership, TTIP. And the Trans-Pacific Partnership, TPP, and NAFTA — all these trade agreements that have been enthusiastically embraced by government leaders at the time, but have yet to bear out the promised benefits for workers and citizens as time was able to pass along from when these original agreements passed. JEAN BLAYLOCK:	CETA is really quite similar to TTIP, which is the trade deals that have been negotiated between the U.S. and the European Union. There are differences between them — largely, to some extent because of the differences between the U.S.’s interests and Canada’s interests, for instance, TPIP would have pushed much harder on health services in the U.K. because the U.S. doesn’t have the same kind of health system that both Canada and most of the European Union countries share in the approach to public health services. But other than that, they’re both trade deals that, as I said, are no longer so much about trade, they’re about deregulation, privatization and introducing corporate courts — these courts which allow phone companies to sue governments outside of the national legal system over any changes in laws that companies feel would be against their interests. NAFTA, of course, is the grandfather of all of the trade deals and is the one where people can see the results in the longest term. The fact that, on the whole, it has not benefited the ordinary people in any of the countries involved, but it has led to increased levels of inequality and it has led to increased power for corporations. KIM BROWN:	So what are you calling for now and can CETA still be stopped? 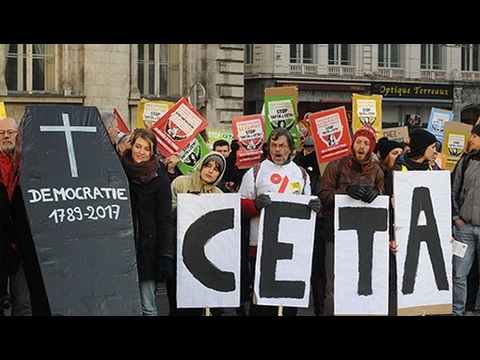 JEAN BLAYLOCK:	CETA can be stopped. We are a week away from a vote in the European Parliament. If the European Parliament does not give its agreement to the deal then it will be stopped. And the vote there is on the knife-edge at the moment, really. It’s encouraging the number of MEPs within the parliament who are listening to people and who are taking seriously the concerns. Because in the past, trade deals have tended just to go through very easily. This one is actually being looked at. It’s going through the process that it ought to be going through. MEPs, as a result of the number of people who have been writing to them, who have been e-mailing them, who have been tweeting them, who have been even picking up the phone and trying to call their offices, are actually looking at what the impacts of CETA would be and are considering whether they really think that it should be approved. Although, the Trade Committee in Parliament, as we mentioned, has recommended support for CETA, the Environment Committee had a big debate around it and the Employment Committee voted against CETA. The Employment Committee said that it would be bad for jobs in the European Union and they recommended that the Parliament should reject CETA. So, it’s good that these issues are being taken seriously, that they are being debated properly, that people are looking at really getting into the detail and trying to understand what the effects would be. And we are still just hoping that enough of the MEPs will look at what the issues are and will vote against CETA. Even after that, if that vote is lost within the European Parliament, CETA still has to be approved by all of the member states within the European Union and by Canada. So it’s being considered by the Canadian Parliament at the moment and if the European Parliament vote is lost and CETA goes through, then it will go to all of the European Union countries. And while, as I said, in the U.K., we have a very scanty process that gives very little scrutiny, some of the other European countries have a much more real and meaningful process and they will have to have a public debate in their own countries and there’s a chance that the deal could be blocked there. KIM BROWN:	Well, speaking of which, the House of Commons just voted to empower the U.K. Prime Minister with the ability to trigger a Brexit. So this government has repeatedly claimed that Brexit means reclaiming U.K. sovereignty and yet this government seems eager to sign onto CETA which will heavily erode the sovereignty of the people. So how do you explain this contradiction? JEAN BLAYLOCK:	Uh, yes. (laughs) It’s a strange contradiction. I mean, like the rhetoric of quite a lot of politicians there’s a difference between what they say that they are in favor of and then what they actually vote for. We will be pushing quite hard as the discussions go on through the whole Brexit process for there to be changes to the way that we approach trade policy in the U.K. and for the need for there to be much more democratic scrutiny, for the politicians to live up to what they said they were doing when they were campaigning for Brexit. If they were campaigning for moral sovereignty for the U.K. Parliament then they need to deliver that. They need to actually introduce processes whereby the U.K. Parliament does have to have a say in what trade deals the U.K. government starts looking at. They need to establish some basic principles for our trade policy, that our trade policy needs to be coherent with our human rights obligations, with our development objectives, with our environmental commitments. And we need to have a process whereby there is actual parliamentary scrutiny throughout trade negotiations, and a real need for parliament to give its agreement before trade deals come into effect. KIM BROWN:	Indeed. We’ve been speaking with Jean Blaylock. Jean is a Policy Officer at the Global Justice Now advocacy organization. She’s been working for over a decade on international trade and food issues. We’ve been discussing the potential passage in the European Parliament of a brand new trade agreement — the acronym for it is CETA and it’s getting some scrutiny and some controversy because it’s not really being fully debated at a minimum by the U.K. Parliament and does not allow for a lot of public input. So, Jean, we appreciate your time and your expertise with us today. JEAN BLAYLOCK:	Thank you very much.